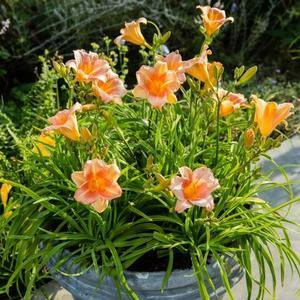 Never Ending® Daylilies have been bred and grown just for you! These ever-blooming wonders set a new standard for providing long-lasting beauty and performance throughout summer for your mixed perennial borders, mass plantings, or containers. Prolific blooms, vibrant flower colors, and vigorous growth make Never Ending® Daylilies the perfect pick for your garden. “Pink Parfait” unique dark to light salmon color of the blooms is mixed with a darker halo and yellow throat.